How Has Edisto Changed Over the Years? As a life-long lover of all things Edisto, it’s always fun to show off the island to newbies. First-timers are almost always amazed at how the beach is just that  a beach. They love seeing the dolphins pop in and out of the water as they make their way up and down the coast, experiencing the crashing of the waves and hearing stories about Edisto’s old days. Here are some of the most notable changes that I have experienced during my life on Edisto. To begin with, there’s Whaley’s. It’s a restaurant now and has been for years, but even now when I walk in I’m instantly brought back to the 1980s when it was a little general store. I used to get up early with my dad and walk from our rental on Point Street over to Whaley’s. I have no idea what my dad bought during those days because all I remember is that I always got an orange juice and a Klondike ice cream bar for breakfast (as long as I didn’t tell my mom who would not have approved of that breakfast) and I’d play with the beach toys for sale. The store was so small, but it was a tradition every year on vacation to go to Whaley’s and buy snacks and beach toys. Nowadays, its a tradition to go to Whaley’s and have a couple of drinks and dinner. So while the name is the same and the traditions have changed, Whaley’s still a major part of our Edisto Beach vacation as I’m sure it is with many other families. Then there’s the Piggly Wiggly. I’ll admit I don’t remember when it became the Piggly Wiggly, but I do remember when it was the IGA. Back then, the store had far less to choose from and so most vacationers would stop in Charleston to buy groceries. After driving 12 hours to get to Edisto only to have to stop for an epic grocery trip in Charleston always seemed like a cruel form of punishment, so it’s wonderful now that the Piggly Wiggly has everything shoppers need for a vacation (granted it does get picked over rather quickly during the holiday weeks). There used to be another grocery store on the island, too. That grocery store was located in the small shopping center where True Value exists. I’m not sure what happened to that grocery store as it didn’t last for very long, but it was nice while it lasted. Now there are two restaurants that used to exist on the beach that shock most people when they hear about them because they were franchises. The restaurants in question were Burger King and Blimpie. 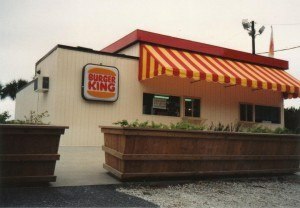 Burger King was located in the building that is now McConkey’s Jungle Shack. I was about 12 when the fast food franchise came to the beach and at that time I was really excited about having a junior whopper for lunch, but there was definitely something odd about coming onto Edisto and smelling the sweet salty air mixed with the greasy burgers. Now I’m not sure again what happened to Burger King, but it didn’t last  and personally I think its replacements, Ruby Seahorse and now McConkey’s Jungle Shack, are far better. Blimpie popped up around the same time in the building next to Whaley’s, which was the former home of Joez Pizza on the Go. Like Burger King, it lasted for a hot minute and then went the way of Burger King. Activity-wise, one of my most favorite former things to exist on Edisto was the miniature golf course. This mini-golf course was simple; it had the standard obstacles like the windmill and loop-de-loops, but was mostly a small set up fun for anyone looking to wind down after a day at the beach. It was located in the area behind the Horizon gas station and next to the Piggly Wiggly parking lot. The last time I played there it was either 1999 or 2000. I went down with some friends and relatives and played a couple of rounds then went home. The next day, we came back to play again and the entire course had been demolished! Needless to say, that day we learned to appreciate what you have while you still have it. Those are just some of the things that I remember from over the years. They’re just small changes, but to me it shows that while things will always come and go, Edisto always remains the same. Stay tuned next week for another blog about Edisto’s not-so-distant past. @Annie I remember the miniature golf course in the state park. My grandmother ran it in the late 70s and early 80s. I used to play all day. My grandfather was a park ranger at the time. I took my wife down to Edisto this summer to show her where I would spend my summers as a youth. The last time I was down there was in 1987. That was when my grandfather was tearing down the only hotel on the beach. It was located where the gas station is now . Right across the street from the pavilion. We took the wood from the old hotel and built my grandfathers house out of it. We even used the big square windows that came out of the pavilion in the house as living room windows.He was a very resourceful man. Other than the miniature golf course being gone hardly anything has changed. I am personally very thankful that there are no major restaurant chains on the island. The last thing I would want to see is for the island to become commercial. If it ever does, it will lose why it is so special to so many families. You can go to a commerical beach anywhere. The laid back Edislo feeling is what keeps bringing back our families. I'd rather support a family owned business than a major chain anyday. Edisto is about having family time and being together and being able to enjoy your surroundings. It's like heaven on earth. In todays busy rushed world I love to get my Edislo time. WE started in the late 7o's and I found it in Southern Living Magazine .When we started down the road to Edisto my husband kept saying [ What have you done ???? ] but when we got there and in the rental , he loved it !! no phone no tv and it was wonderful !!!! We only left the Island once that week and that was to go to to Charleston . The rest of the time we were on the beach . My husband caught enough crabs in a crab trap for a great meal for us and our upstairs neighbors [ 15 or so ] !!! We have been back several times and really love Edisto ! I like it because it is so laid back and I would recommend to evry one . going back this summer Yahoo !!! !